Posted by mareserinitatis in Fargo, older son, running. 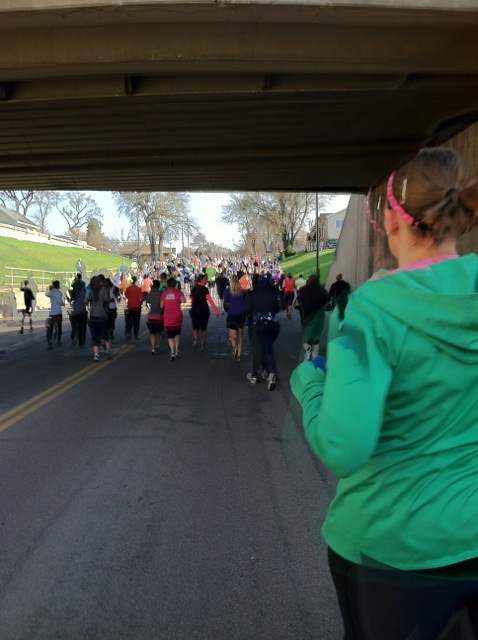 Those of you who have followed my blog for a while know that I enjoy running. Or I used to. Part of that is because the older son got a job with very odd hours. Because he does not yet have a driver’s license, Mike and I have been taking turns getting up at obnoxiously early hours to take him. Then I went on a trip to a conference. Then we all got sick. The list goes on and on. The result is that I found it nearly impossible to run except right before bed…and running right before bed has this tendency to keep me awake all. night. long. However, back in December or January, when I was motivated, a friend and I began talking about doing a relay for the Fargo Marathon. Then we found out there was a costume contest with the relay. Well, obviously we had to do it! 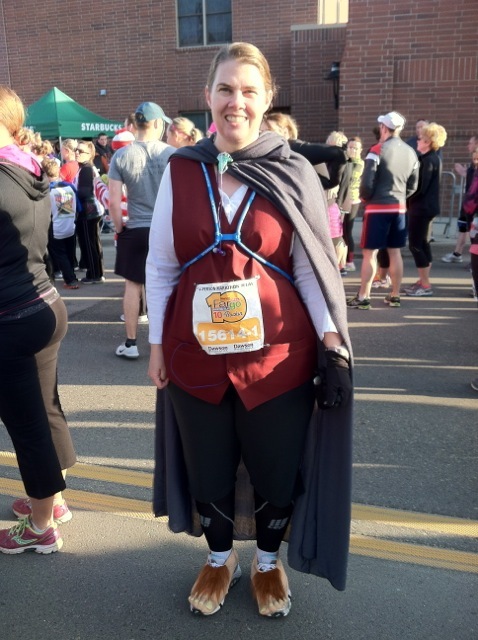 If you’d like the full details, you can visit Kari’s blog and check out her post: How to be the biggest geek at the marathon. The beginning, of course, was packed. 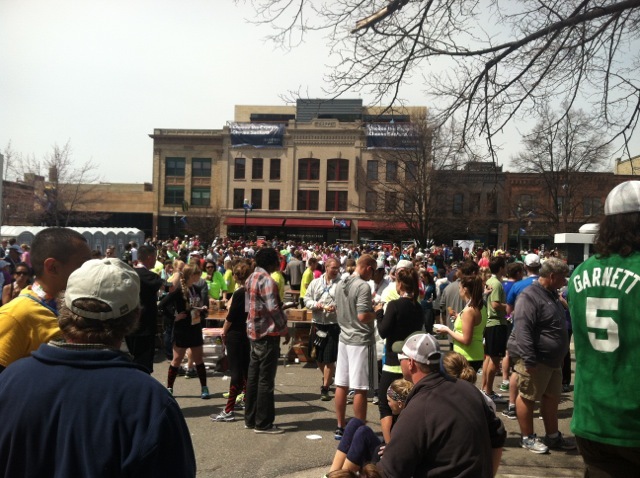 This is what it looked like until the 10k turned off from the route, at which point, it became very sparse. I suspect that’s because I was running in the opposite direction of most of the marathoners, almost all of whom are much faster than I am. I have to admit that I would like to do the relay again just because I won’t have to dodge around so many people. Unlike most of my team, I apparently was more confusing than anything in my costume. 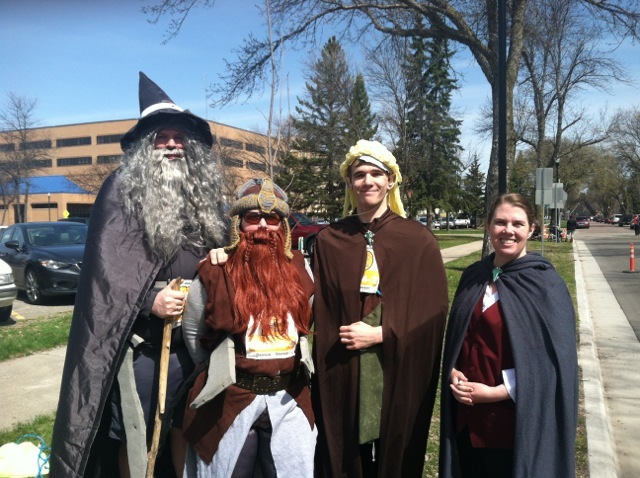 No one yelled, “Go Frodo!” or, “Destroy the Ring!” Perhaps I needed a wig? Anyway, most people apparently are unfamiliar with hobbits, and the fuzzy feet only added to their confusion. I did ask someone if they knew where Mt. Doom was, but they just said, “Huh?” and shook their head. The one person who did recognize me was (Danny) Elvis. I didn’t get a chance to take a picture of him because I was too busy high-fiving him. After I ran past, he announced, “Yes, ladies and gentlemen, we have the One Ring right here at the 2014 Fargo Marathon.” I’m really happy that Elvis is a geek, too. 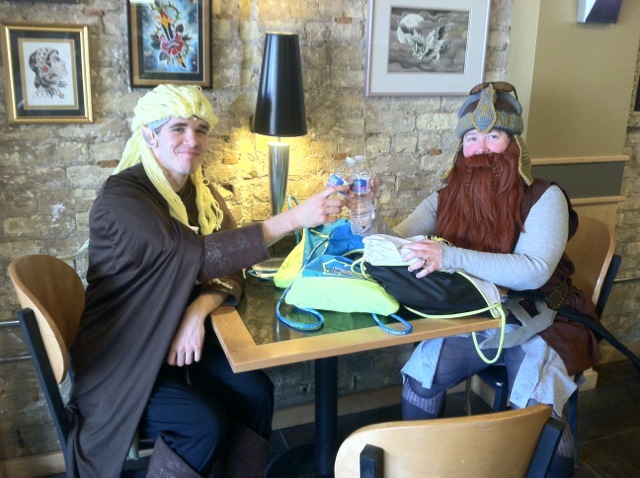 After Legolas, Gimli, and myself finished our respective relay legs, we went downtown for some free munchies. Apparently all the marathoners beat us there, too. Even the street fair isn’t that packed. While waiting for Gandalf (have you noticed he always shows up at the last minute? ), we decided to get out of the heat and took a stop at the Prancing Pony Atomic Coffee. I’m sure the usual patrons were thinking that the place had gone downhill since they were starting to let dwarves and other unsavory folk in. 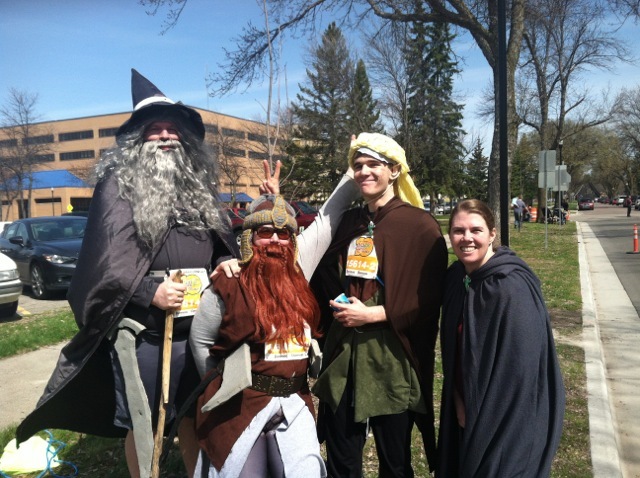 Finally, Gandalf came in and we raced to the finish line together to receive our medals…half an hour before they closed the course down. One thing I learned is that quests can take a long time, and Peter Jackson really glossed over that particular aspect. Either way, we all had a lot of fun and are already planning for next year’s race. Better yet, I think I’ve found my motivation again.